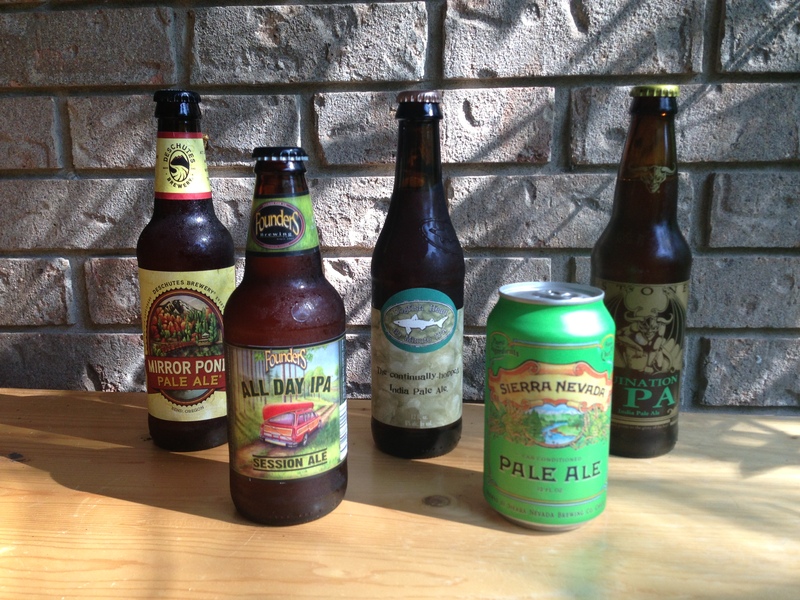 This is the eighth installment in our series on American pale ales, American IPAs and double IPAs. The series began on July 28.
. . . and when all else fails, add more hops. Once you know the best hop varieties to use in an American hoppy ale, and the ways they can be added during the boil and beyond, all that is left is to figure out how much to add. As we’ve seen, there are many ways to get hops into your beer, and I can’t cover every possible permutation. What I’ll do is give recommendations for beers based on the common homebrew three-addition hop schedule, with a bittering addition early in the boil, a flavor addition with approximately 15 minutes left in the boil and an aroma addition at the very end of the boil. Given the topic, I’ll also discuss dry-hopping. Using these recommendations, you can construct a recipe that’s “to style” for any of these beers, and use this as a starting point to tweaking and refining your own favorite recipe. Although the following “rules of thumb” work well, I’m not suggesting that other approaches won’t work. When thinking about hopping this kind of beer, I like to start with dry hopping and work “backwards” to the bittering addition. This way, you can total up the IBU contrubutions of the early additions, and then just calculate the correct amount of bittering hops needed to hit your target. Since late addition hops are added primarily for aroma, I consider the weight of the hops rather than their alpha acid rating or IBU contribution when making a recipe the first time. Any of these beers benefit from dry hopping, although not all American pale ales are dry hopped. Dry hopping adds hop aroma to fermented beer, as well as contributing other plant compounds that cause a haze in beer. A good rule of thumb for dry hopping 5 gallons (19 L) of American pale ale is to use between 0.5–1.5 oz. (14–42 g) of hops. For IPAs, use 1.5–2.5 oz. (42–71 g) and for dIPAs, 2.0–5.0 oz. (57–140 g). Hops added in the last 5 minutes of the boil — or at knockout — add primarily aroma to the wort prior to fermentation. Since both dry hopping and aroma hop additions supply aroma, it is wise to consider them together. In a 5-gallon (19-L) American pale ale, a final hop addition (with 5 to 0 minutes left in the boil) of between 0.5–1.0 oz. (14–28 g) will give you the right amount of hop aroma for the style, particularly if the aroma is accentuated by dry hops. If you aren’t dry hopping, 0.75–1.5 oz. (21–42 g) would probably do the trick. Overall, if your dry hops plus your late hops together weigh 1.5–2.25 oz. (42–64 g), you’re in the right zone. For an IPA, late hopping in the 1.0–2.0 oz. (28–57 g) per 5-gallon (19-L) range will give you the right amount of aroma, presuming you’ve dry hopped the beer (which is de rigueur for the style). Overall, if your dry hop and late hop amounts add up to 2.75–3.5 oz. (78–99 g) per 5 gallons (19 L), your IPA will have an appropriately enticing hop aroma. In dIPAs, the amount of hops added can climb to ridiculous levels. At a minimum, 1.5 oz. (42 g) of late addition hops per 5 gallons (19 L) or a combination of at least 3.5 oz. (99 g) of dry hops and late hops combined are required. It’s not unusual to see 5-gallon (19-L) homebrew recipes with 4–5 oz. (110–140 g) of late hops. A lot of homebrew recipes add hops with 15 minutes left in the boil as “flavor” hops, and I’ll let any hops added between 6 and 25 minutes fall into this category. So far, the IBU contribution from the hops are either 0 (for dry hops) or small enough to ignore (for hops added at knockout, assuming wort cooling started immediately afterwards). With flavor hops, some alpha acids will be extracted. In any of these three beers, the flavor addition can be omitted. And, looking at homebrew IPA recipes, the numbers vary wildly. Since some aroma will also come from these hops, their levels also tie into the level of aroma and dry hops. For 5-gallon (19-L) American pale ales, anything in the 0–1.25 oz. (0–35 g) range would not be out place. The higher end of this range would correspond to beers that fell in the lower part of the previous combined dry hop and aroma hops range. For IPAs, 0–1.5 oz. (0–42 g) is frequently seen, again with more hops added in this time period when fewer are added near knockout or as dry hops. For dIPAs, 0–2.5 oz. (0–71 g) is common, with the some proviso as in the other beers. Once you have your flavor, aroma and dry hops decided, type them into your recipe calculator and how many IBUs they contribute. Then, add a bittering addition — usually with 60 minutes left in the boil, but boiling these hops for 75 or 90 minutes isn’t unheard of — to bring your beer up to its IBU target. To limit the amount of extraneous plant material in the boil, I usually choose the highest alpha hop I can find that is acceptable as far as flavor and aroma go. This series will conclude with a discussion of fermentation and conditioning. For homebrews made with three kettle additions — bittering (early in boil), flavor (25–6 minutes left in boil) and aroma (5–0 minutes left in boil), assuming wort is chilled with immersion chiller starting immediately after knockout. These guidelines work, but this does not mean other hopping schedules won’t. Numbers in ounces of pellet hops per 5 gallons of wort (unless otherwise noted). Numbers in grams of pellet hops per 19 L of wort (unless otherwise noted). Nicely done, Chris. I agree, but at the high end of your hopping rates. I make lots of IPA’s, usually about 4 or 5 per year, and I get scores in the low to mid 30’s in contests. A big factor is timing, since both aroma and bitterness rapidly drop off after peak, which is only a week or 2 after dry hopping an IPA. Thanks, keep up the fine work. Thanks. And yes, if you are entering homebrew contests, I’d stick to high end of these suggestions (if not slightly beyond). The middle range will yield a more restrained beer and the low end of any of these scales needs to be paired with a larger addition at another stage. Care to comment on aroma hop additions after the wort has been chilled to 160°F to 180°F? Sure. Adding hops to the hot post-boil wort is called whirpool hopping. (Homebrewers sometimes call it a hop stand.) You’ll get a bunch of aroma, but little hop bitterness (none if it’s below 185 °F). I mentioned it in the previous article along with late hops. What alpha acid levels have you assumed when you listed these amounts?